As the AudioVisual (AV) Librarian, I have a passion for all things media especially as related to music (CDs) and movies (DVDs). On October 19, 2010, I was lucky enough to secure a spot in an Advanced Screening of a documentary movie entitled, “Forks Over Knives” with my wife, Monika. While film is a passion of mine, her passion is food and, more specifically, Vegan Food. She is also very interested in the science and health benefits. She is somewhat of an authority on the topic due to her vivacious reading various books as it relates to the topic as well as interest and recommendation of films. She also has proven to be a big inspiration to all (our family, our friends, and myself) that surround her with relation to her vast knowledge on this topic, as many of us have altered our eating habits and menus because of her. It was because of her idea that we attended this event. “Forks Over Knives” examines the profound claim that most, if not all, of the so-called “diseases of affluence” that affect us can be controlled, or even reversed, by rejecting our present menu of animal-based and processed foods. The major storyline in the film bases the personal journeys of a pair of researchers, Dr. T. Colin Campbell and Dr. Caldwell Esselstyn. With movies like “Food Inc.” and “The Future of Food”, “Forks Over Knives” is another film to make us re-evaluate what we eat, what we are told to eat, and how it effects us. There seems to be a growing movement in this direction as the information gets out and becomes more and more prevalent and mainstream. I’d recommend it to anyone interested in their health and food. 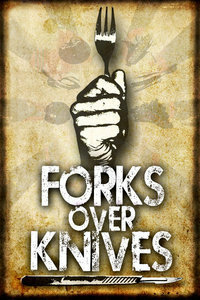 So how about giving Forks Over Knives a try? This entry was posted in Food & Drink, Lifestyle and tagged Brian S., Film Documentary, Food & Drink, Forks Over Knives, Health, Healthy Lifestyle. Bookmark the permalink. Thanks, love! It was so nice of you to mention me in your blog. I would like to add that I believe everyone should watch the documentaries you mentioned above. Even if you don’t agree with the fact that a plant- based diet is the healthiest lifestyle, better for the environment or kind to all life, expanding your knowledge isn’t a bad idea. Maybe negative situations in the world wouldn’t get so out of control if everyone paid more attention. Read and watch films about things that are foreign to you and expand your mind. Knowledge equals power! Food for thought- for being such a well fed country don’t you think it’s ironic that we have the highest disease rates in the whole world?! For being so well fed and taken care of, there sure are a lot of Americans dying! Maybe it’s what we put in our food and what type of food we’re eating….. I watched Future of Food, Food Matters, and Food, Inc. within the last few days. Sad, scary stuff is presented, but good to know. I can’t wait to see this movie. With a family history of Diabetes, I am interesting in seeing the reversal of disease due to diet. I am curious, I know you went to a Question and Answer session at the advanced screening. Was there anything interesting that you can share?